Fixing My Gaze - Can you imagine not having 3D vision? 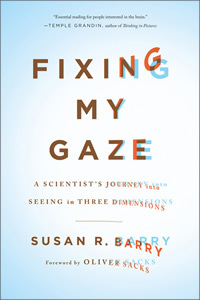 I just read an inspirational book called Fixing My Gaze about neuroscientist, Susan Barry, who was born with strabismus (an eye turn) and had lived all her life without stereo vision, meaning that she could not see in three dimensions. She had three surgeries to "correct" the eye turn cosmetically but she still could not see properly and the eye was still turned, although less than before. She had lived this way for over 40 years until she met optometrist Dr. Theresa Ruggiero. Dr. Ruggiero treated Susan with vision therapy and corrected the eye turn and allowed her see in three dimensions for the first time in her life. Can you imaging how her world was transformed? I've heard rumors of a "Fixing My Gaze" movie but have not been able to confirm them. "For the first time, I could see the volumes of space between different tree branches, and I liked immersing myself in those inviting pockets of space. As I walk about, leaves, pine needles, and flowers, - even light fixtures and ceiling pipes - seem to float on a medium more substantial than air. Snow no longer appears to fall in one plane slightly in front of me. Now, the snowflakes envelope me, floating by in layers and layers of depth. It's been seven years since I gained stereovision, but ordinary views like these still fill me with a deep sense of wonder and joy." Our vision therapy practice includes many patients with strabismus but all of them are very young (obviously it is better to fix the problem when a patient is young to save her from living years with the condition). Susan Barry's story is remarkable in that she was in midlife when she received vision therapy. The conventional wisdom, now being disproved by new studies, was that after the age of 7 or 8 , the brain could not be trained (or "rewired") to see in new ways. The old scientific thinking was that after early childhood, the brain became fixed. In fact, Susan Barry herself and other scientists thought that it was impossible for her to ever see in 3D. Now, we know that the brain exhibits neuroplacticity and that given the proper behavioural therapy, even adults can rewire their brains. This has given hope to many people who did not receive treatment for visual processing disorders at a young age. Now it seems possible that even older patients with amblyopia or strabismus and other binocular vision disorders can benefit from treatments like vision therapy. You can hear interviews with Susan Barry and read more about her story at her website: http://www.fixingmygaze.com/. Are your kids dangerously inactive? It shows up in their eyes. We already know that many diseases like diabetes and heart disease show up first in the eyes. A new study shows that changes in the back of the eye can tell us if a child is on the path to future diseases. A new Australian study published in the journal Arteriosclerosis, Thrombosis and Vascular Biology concludes that dangerously inactive children have narrow arteries in the retina, the back of the eye that contains the cells that send visual information to the brain. In today's world, where children spend hours sitting in front of the TV or the computer, inactivity is a major problem. Narrow retinal arteries are a marker for increased risk of high blood pressure, heart disease, and diabetes down the road. The study found that children with the highest levels of physical activity, one and half hours a day, had significantly wider average retinal arteries than those who spent less than half an hour a day being physically active. The study shows us that knowledge (and an eye exam) is power. Because optometrists can detect narrow arteries in an eye health exam, we can identify the risk early enough in life and do something about it to prevent often deadly chronic diseases from showing up in adulthood. The doctor can then monitor the retina to track improvement or worsening of the arteries. Retinal examinations are done by most optometrists during an eye health exam. I'm seeing more patients with complaints of itchy, watery eyes. And my husband is complaining like crazy and begging for a prescription! That means it's spring and allergies are here. In fact, in the northern part of North America (which includes most of Canada), allergy season is expected to last as much 27 days longer than normal according to a study published by the Proceedings of the National Academy of Sciences. Eye allergies are a reaction allergens such as pollen, mold, dust mites and pet dander. They get in the eyes and cause inflammation of the tissue that lines the inner eyelid. There are a number things you can do. If you wear contact lenses, consider switching to daily disposable lenses. They are by far the most comfortable lenses on the market. Allergy season can make contact lenses more uncomfortable and comfort declines significant in weeks three and four for a monthly lens. You can avoid most of these problems by switching to a daily lens. Although daily lenses are more expensive, you don't need to buy solutions and they are super-convenient because you don't need to clean and care for them. They are unbeatable for traveling. Allergy medication is an another option. Oral, all purpose allergy medication like Claritin should be used with caution, especially if your main complaint is itchy and watery eyes. These pills can dry out the eye and replace one problem with another. There are a number of prescription eye drops designed to eliminate itchy watery eyes that your eye doctor can tell you about and prescribe if appropriate. Many of these are very effective, now come in "once-a-day" formulation, are pregnancy safe and can be used in children as young as two years old. For a child, who needs a parent to apply the drops, the once-a-day option is convenient because you can give the child one drop in the morning and he is good for the next 16 hours of summer camps, sports, hikes and everything else than makes summer fun! Another point for the vegetarians! There is a new British study published in the The American Journal of Clinical Nutrition (it's in the March 2011 issue, if you want to read it) that concludes that vegetarians and vegans have a much lower risk of cataracts than meat-eaters. The researchers monitored the medical records of 27,670 non-diabetic people aged 40 or over to see if and when they developed cataracts. They found a strong correlation between a person's diet and cataract risk. One remarkable thing about the correlation is that the risk was highest for high meat eaters (those that eat more than 3.5 ounces of meat a day). The next highest risk was for moderate meat eaters, then low meat eaters, followed by fish eaters (people who eat fish but no other meat). Vegetarians and vegans had the lowest risk. This means that reducing your meat consumption, even if you do not become fully vegetarian, will reduce cataract risk. There was a big difference in risk between vegans and meat eaters. The risk for vegans was about 40 percent lower than it was for the high meat eater category. Cataracts are a clouding of the eye's crystalline lens that usually develops slowly over time. (In the case of post-traumatic cataracts, however, they can also occur very quickly.) It is the leading cause of poor vision in adults. What if you have cataracts? I routinely diagnose cataracts and if surgery is required to remove them, I refer patients to a good surgeon. With today's surgical techniques the surgery can be as quick as 15 minutes! However, all surgery has some risk and should not be undertaken lightly. And with cataract surgery it will cost you several hundred dollars for a good quality replacement lens if you want the best vision (MSP pays for the most basic lens but it is definately far from the best). It is always better to prevent the condition for occurring. Watch this video to learn how cataract surgery is done. The video makes it look simple but there is much more to it than the video suggests. People like coupons that they can email to their friends. Several readers have asked for one for the free eye glasses promotion. So, here it is! Tune in to RJ 1200 (am 1200) today at 2:00 p.m. to hear me on the radio talking about eye health and vision issues that arise in the summertime when the sun is hot and the UV index is high. "Get your eye glasses for free - and save your sight in the process"
I'm doing what I call a "See for Life" campaign by giving away free prescription glasses to my patients. In case you are wondering, that includes the frame, single vision lenses, scratch resistant coating and 100% UV protection. The idea is to motivate people to come in for their annual eye health exam. What prompted me to do this? I was seeing lots of patients who have gone years without an eye exam. I've had the sad responsibility to tell some of these people that they have glaucoma. Not only that, but the disease has already caused permanent vision loss in some of these people. One unlucky man had lost enough peripheral vision that he was no longer legal to drive. If there is one happy note in the latter story, this unfortunate fellow didn't earn his living driving a vehicle. If there are any truckers or cab drivers or pilots out there, do not take your eye health for granted! Being blind (pun intended) to the risks could have a huge impact on your life. The tragedy is that only if they would have come in for an exam, we would have caught glaucoma early and stopped its progression. No one needs to loose their vision because of glaucoma but it happens if you are not proactive. See your eye doctor once a year to make sure that you are free of the disease and that you are not at risk. The only way to know is to see your eye doctor. The disease slowly and imperceptibly robs you of your vision. The poor man who lost his license suffered permanent vision loss but he never knew it was happening. It sneaks up on you quietly. Don't let it get you! So here is what I'm doing to motivate people to take their health seriously: if you are between the ages of 19 and 64 you can get your glasses for free when you have your eyes examined. You can get more information from my website: www.freeglasses.ca.